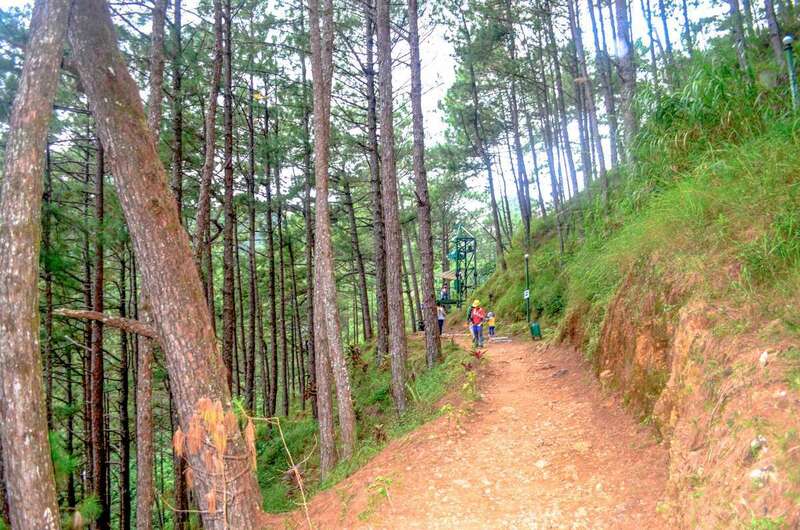 When I want to experience extreme in Baguio, only one place comes to mind. 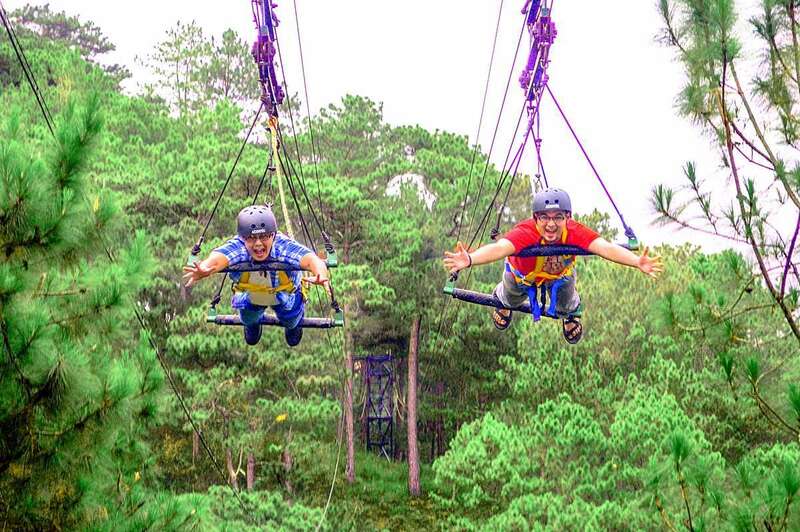 Combine fun, adventure, and maybe a touch of terror when you visit Tree Top Adventure in Camp John Hay, Baguio City. It’s definitely worth the experience. Something you will surely never forget. I know I won’t. 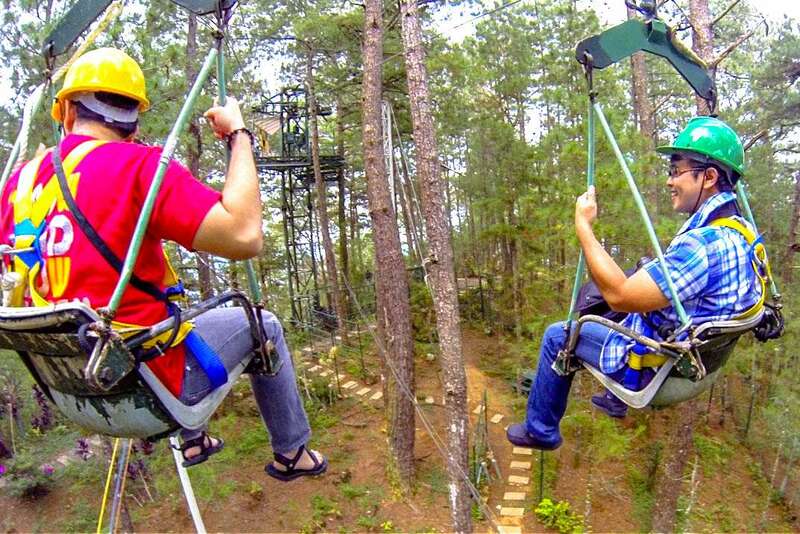 My Tree Top Adventure Baguio experience was the highlight of my 2013 trip to the country’s summer capital – Baguio. It’s world class and definitely safe. They’ve installed safety lines and their instructors and facilitators are not just technically equipped, but funny too. The park is full of trees giving that refreshing “nature” feel. They use the “Tree Trunk Clumping Mechanism” to ensure that no tree is harmed in the park. It means the platforms are clumped together and built tight enough so that they won’t fall off the tree trunks. No nails, screws and the like were used on the trees. If you want to experience all the activities, allot around two hours. This will also depend on the number of guests present. The more guests, the more waiting time it will take. 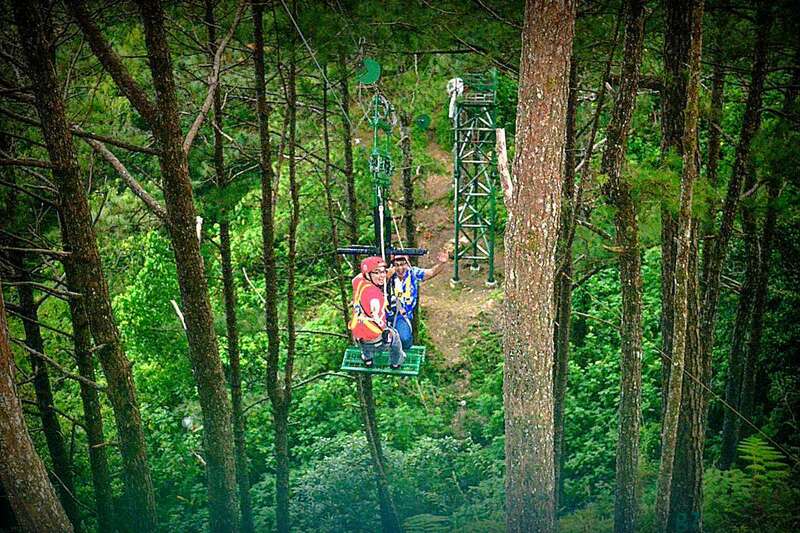 The Canopy Ride is an adventure where in you will be seated on a cable chair and will be transferred from one tower to another. This adventure is similar to cable car however, you will be seating on a chair. The Canopy ride have 8 stations and also a connecting ride which is Funicular; a 30 meter ride similar to an escalator but instead of standing up our guest would be seated down either going up or going down depending on their canopy starting point. The distance of the canopy is approximately 800 meters cable line and the height is approximately from 20 feet to 100 feet above the ground. This adventure accommodates 4 people at a time and you will be transferred several times during the ride. This ride will last for 30 mins. to an hour. So for those who just want to sit back, relax and enjoy the view, the Canopy ride is just what you need. Are you a bird? Are you a plane? No, you’re Superman! Take this ride face down and feel how it is to fly over creation. The Superman Ride is a 200 meter long, 150 feet high cable zip line that gives you an astonishing view of the mountains for about 2 minutes. In this adventure, you will first fly backwards and then forward at the speed of 9 meters per second. Meant to be experienced in tandem, this adventure accommodates 2 persons at a time to double the fun! Fly high and get high on The Superman Ride! If you’re truly scared of heights, try The Tree Drop Adventure to conquer your fear. This is a free fall adventure where you will step off a ledge and be dropped 60 feet down in a matter of 2 seconds. You can experience it 3 ways : first, the Conventional Way where you will be sitting on the harness, going down. Second, the Lizard Style where you go down head first and feet up – it’s how Spiderman went down to kiss Mary Jane. The last and most exciting position is ala Tom Cruise in Mission Impossible I. Called the Australian Style, you’ll summon all your adrenaline for this one. Drop with your face to the ground and your arms outstretched and experience the GForce in all its glory. This is the Ultimate extreme adventure — the Tree Drop Adventure! Would you like to conquer the sky? Then be The Silver Surfer if only for a day. Stand atop a specially designed ledge, hold onto a bar and simply fly. 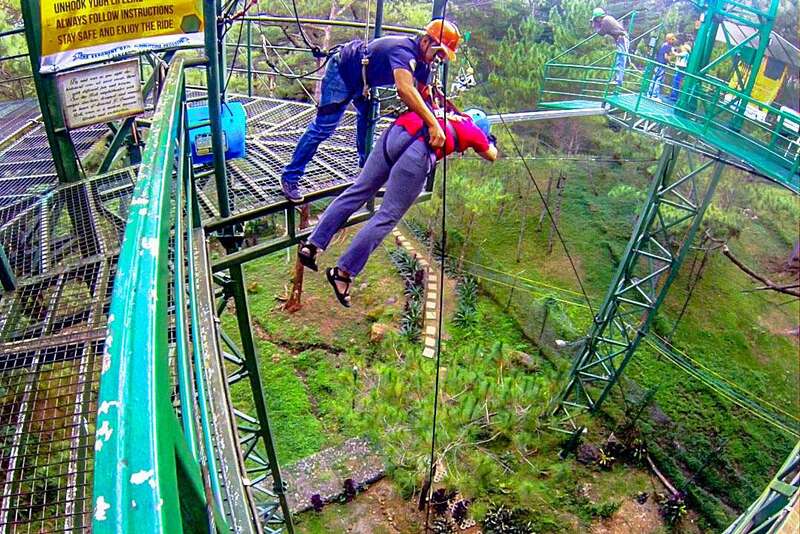 The 70-meters long diagonal zip line takes you up to a tower at a speed of approximately 6 meters per second. This adventure accommodates 2 persons at a time, facing each other, and makes key stops midway through the ride. Expect to swing on air at every stop to feel the excitement of this adventure. Experience 3 back and forth cycles that take only 2-3 minutes a ride. What a great way to fly! Note: Meal Arrangements are offered upon request. Rates are subject to change without prior notice. 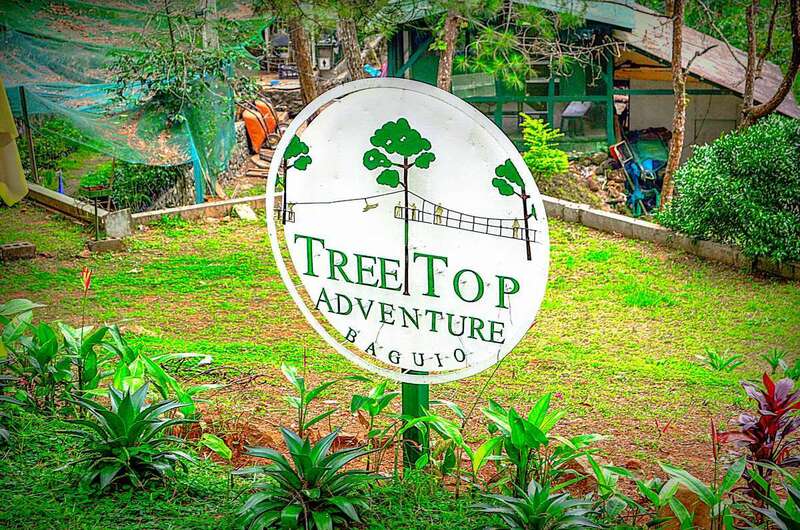 Tree Top Adventure – Baguio Inc. will be having an admission fee amounting Php100 per person, consumable in any single transaction of individual or package adventure. It can also be used for trekking adventure. This regulation aims to control the number of guests entering the facility for added safety and comfort. Children below 3 feet 6 inches are free of charge.